Synopsis: Set sail for a fun filled voyage and hilarious pirate antics with the biggest Band of Misfits on the seven seas! When the infamous Pirate Captain (Hugh Grant) is shunned once again by his rivals Black Bellamy and Cutlass Liz, he sets his sights to win the coveted Pirate of the Year Award! With his trusted dodo, Polly and rag-tag crew at his side, the Pirate Captain will need to battle a diabolical queen, save a young scientist and never lose sight of what a pirate loves best: Adventure! 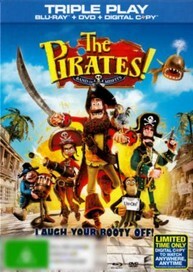 The Pirates Blu-ray. As new condition. Happy to post but cannot take responsibility for any loss or damage in transit. Happy to combine postage. Please check out my other listings.